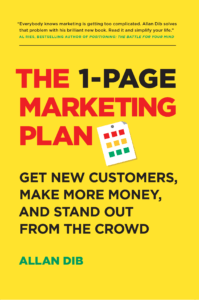 The 1-Page Marketing Plan canvas is the easiest and fastest way to create a marketing plan that will propel your business growth. Everybody knows marketing is getting too complicated. Allan Dib solves that problem with his brilliant new book. Read it and simplify your life. Learn powerful and proven direct response marketing strategies that will help you grow your business fast.